Welcome to One Pink Toothbrush, where I will be posting moments from my days as a mum and as a wife. Funny moments, messy moments, thoughtful moments, teary moments.... and hopefully using each moment to see what God might be saying. Last night I made an epic meal; turned a chicken into a dove. I made Spinach trees, flowers too, for that bird to soar above. 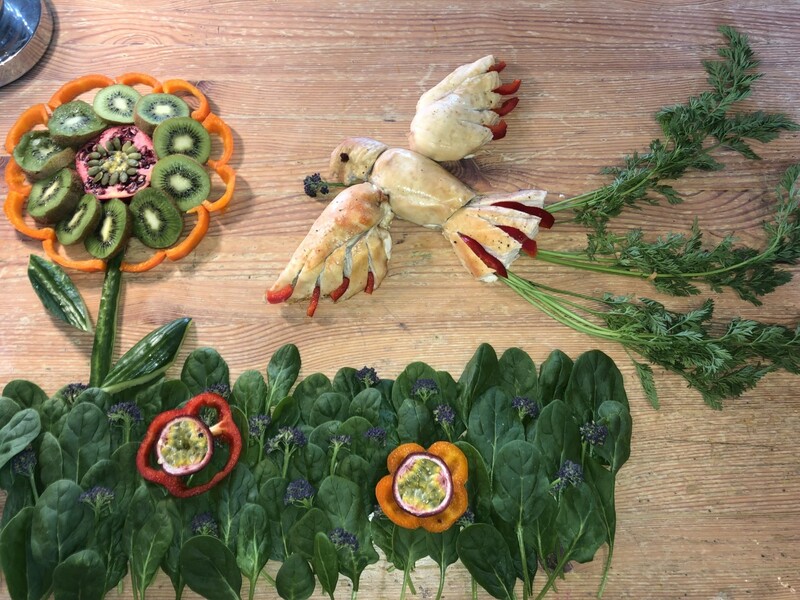 I made a beautiful flower, out of vegetables, seed and fruit. With bits of purple brocolli growing through the grassy roots. I sat all my children at the table, and opened up God's word. I made sure the story from Matthew six was taken in and heard. I asked for answers to my questions. Are they taking it in? And when they added their own thoughts, I took it as a win. Tonight I gave them leftovers. All yellow, and no green. And we ate it in the lounge, infront of a total of 5 screens. No one talked. No one shared. We watched just on our own. I was happy for the quiet, and welcomed time on my phone. There's balance to family life. There's highs and there's lows. There's friendships formed forever and a fighting pair of foes. There's moments of awe and wonder, and times of celebration. There's moments when you desperately seek a personal vacation. At both meal times, the kids were fed, and that's an achievement. It's something to be grateful for, tonight as their parent. Their tummies have been filled, with carbs or with veg. I know compared to many, that is indeed a privilege. Some days us mums are soaring, going above and beyond. Some days us mums just can't do it, and that's ok, it's not wrong. Some days us mums give and give, and then we give some more. Some days we've got nothing left, but yet we still give more. There are times I really study God's word, and grapple it in my brain. There are times I just listen to the 23rd Psalm....again. My kids are seeing it both in action, they're taking it all in. I hope they know that God's truth dwelt on, is of course, a win. Maybe tomorrow, I'll make a colourful Bible based meal. Or maybe I'll say they can just help themselves to a box of cereal. Maybe I'll trip up tomorrow, or maybe I'll win the race. There's balance to family life, and even better, there is grace. Last night, I made a bird out of a bird! My eldest came in and asked me why I was shaping a chicken on the kitchen table, and shoving carrot tops into it. He followed up quickly with, "actually, never-mind", as he left me to it. 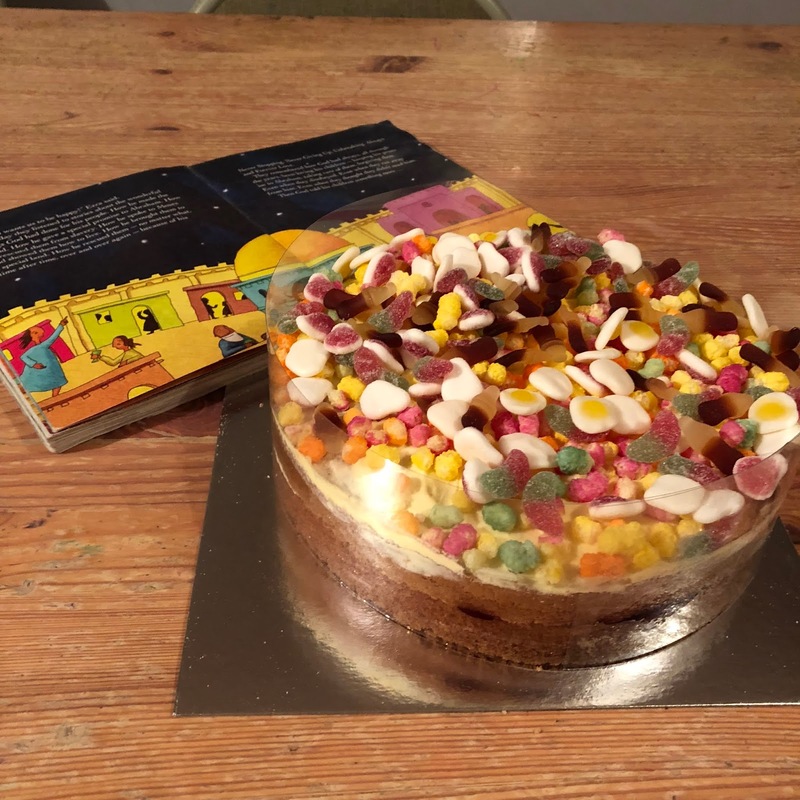 It was the next instalment of The Jesus Story Book Bible dinners of course, and it was a fun one to make, because I had pre-planned it in my weekly shop, making sure I had foliage and bright colours. Page 228 of the JSBB, finds us at 'The Singer', a chapter derived from The Sermon on the Mount in Matthew 6. The Sermon on the Mount is probably Jesus' most famous sermon, or preach that He ever gave. Emmanuel, the church I attend, is going through it as a series at the moment, both with the adults and in the kids' & youth work. The whole sermon can be summed up in a sentence; 'how to live a life that is dedicated to, and pleasing to God'. It's a Godly wisdom sermon, looking at our values, our vision and our habits. It was meant to be memorised, recited and and dwelt upon. The Jesus StoryBook chapter I read with the kids over dinner, was about the birds and the flowers, which is hopefully clearer from the picture than some previous weeks! 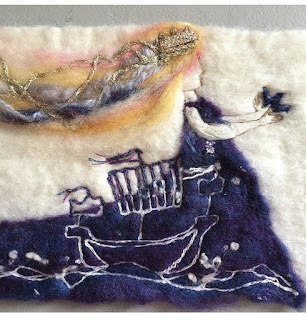 Jesus was asking the people who were listening, if the birds have to go shopping for their food, and if the flowers have to store their home-made or shop-bought clothes in a wardrobe?! Of course not, God provides food and shelter for the birds and He provides the beauty the flowers adorn. The point Jesus is making, is that God the Father, cares more about us than He does about the flowers and the birds, but look how well He takes care of the flowers and the birds. Surely He will therefore take care of us even more so. Why do we spend so much time worrying therefore, about stuff? Why do we worry about the provision and what we look like? God's got it all in hand. Worry adds nothing to our lives, it actually just steals from us. It's a stealer of peace. It can be a stealer of action, of courage even. It's a stealer of trust from God. And the Bible doesn't just teach us not to worry, but to seek God's kingdom, to seek His righteousness, and see Him provide what we need. In my own Bible reading this morning, I was reminded of how the flesh in all it's beauty, is like the flowers of the field, it will simply fade away. It's like the grass, which will wither away. No wonder we're not meant to worry about the provision for, and the look of our bodies, or indeed the things of this lifetime, because they will come to nothing. Unlike our souls of course, which will go on to live gloriously with God, with brand new bodies! And what won't ever fade or wither away? The word of God, the Bible will stand forever. I think I shall forever taste Spinach when I read Isaiah 40v6-8 from now on. "The grass withers, the flower fades...but the word of our God will stand forever". Last night we managed to read a story in The Jesus Story Book Bible altogether. It's becoming harder for me to pin them all down in one room, but we turned screens off and I set out my expectations. The four year old decided this would be the time to try out her handstands over the back of the sofa, but she was still engaged. I presented dinner to them, which was met by literal belly laughing from the teens. 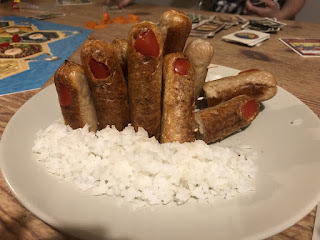 You see I had obviously arranged the sausages we were having, into praying hands, because we were about to read "How to Pray". The littlest encouraged me. She was afterall, pleased I had made a 'castle' for dinner. And as we do all day long in this house, we ate some bread too. Apparently man cannot live by bread alone, but my kids really seem to put that theory to the test. 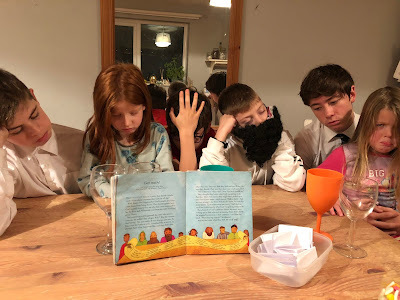 We read the story, with interuptions galore, and I asked them to close their eyes as I read the Lord's prayer. 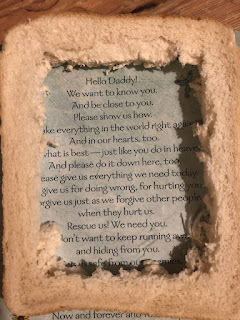 I wanted them to pray it in their hearts and minds, while I read the words, and I asked them to think of one bit which struck them in some way. One child was drawn to God's kingdom coming, so we unpacked that a little, talking about God's will and healing. One child commented about how much sugar was in bread. One child was a little confused and said some confusing things, which we had to unpack a little, but also put to one side a little, as I was losing the focus of the room. And then one asked if God would be in control of Hell, and if He'd be there... Love a tangent! One of the boys mentioned that trespasses (as it read in our version) didn't mean someone coming onto our land, or into our house. But I've just read something this morning, which actually explains that that's exactly what it means. "A trespasser occupies a realm, or exercises a right that rightfully belongs to someone else. A trespasser violates another person....We have not merely borrowed from God an unpayable debt for which we appeal for bankruptcy protection. We have seized a realm and exercised a right that belongs to him. We have violated God". I must follow this up with my boy. He likes words and meanings, and I think this will help him see sin in a new way. A couple of the kids commented on the aspect of forgiving others. We discussed how siblings seemed to be the hardest ones to forgive. But we looked at how much God has and continues to forgive us for our stuff, which was helpful. And I pointed out that I'd had to forgive someone who had given into the temptation of rudeness to me during the Bible time itself, but that I can do that freely and quickly because of what God has forgiven me for. (Really had to forgive quickly on that one, rather than sit in the grrr for a while). God's provision of Daily Bread was a great point for my kids. I literally handed out bread, and reminded them that God gives it to us, and we had a little think about the good things He provides for us. Someone had bought us a Family Take Away on Monday evening, so they were thankful for God's tasty provision. 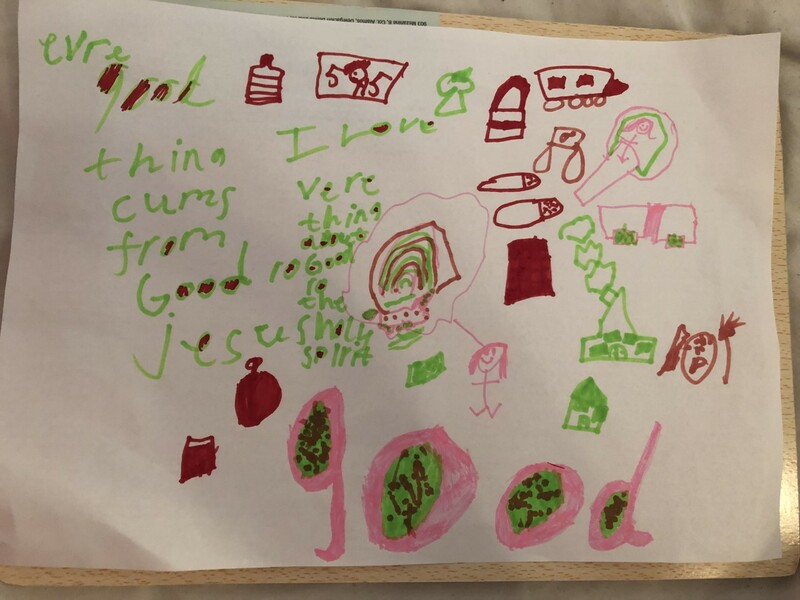 Earlier in the day, me and one of the girls had dwelt on the good things from God, so it was helpful to link it all up together. We are often the recipients of hand-me-downs, and with six kids, this is obviously a blessing. It's quite hard now to get any for the nearly 15 year old monster that lives here. We are all tiny minions compared to him, and the only family member who is taller than him, is Grandad who isn't exactly on trend (I'm sure he was at one stage). Even the husband will have a little look through the bag if the trendy 20 year old nephew is getting rid of anything! For the girls though, we have some regular donations, which is fab. And what I've learnt about girls' clothes, is that even when you think its grown out of, you simply put it with another outfit, and it's back to being in use again; trousers which are too small, suddenly become cool three quarter lengths, with a pair of denim shorts over them. Also, my girls change their outfit numerous times a day. This was all new to me after the four boys! One of my girls recently got given a black onesie with sparkly stars all over it. She went and put it on straight away, and loved it. My other girl seemed to take offence at this new item of clothing in the house. Well she didn't take offence at the item, but to the fact that she didn't have one. She wasn't interested in the thought of borrowing it, she just wanted one for herself. She expressed herself very clearly, on the kitchen floor, for all to hear. 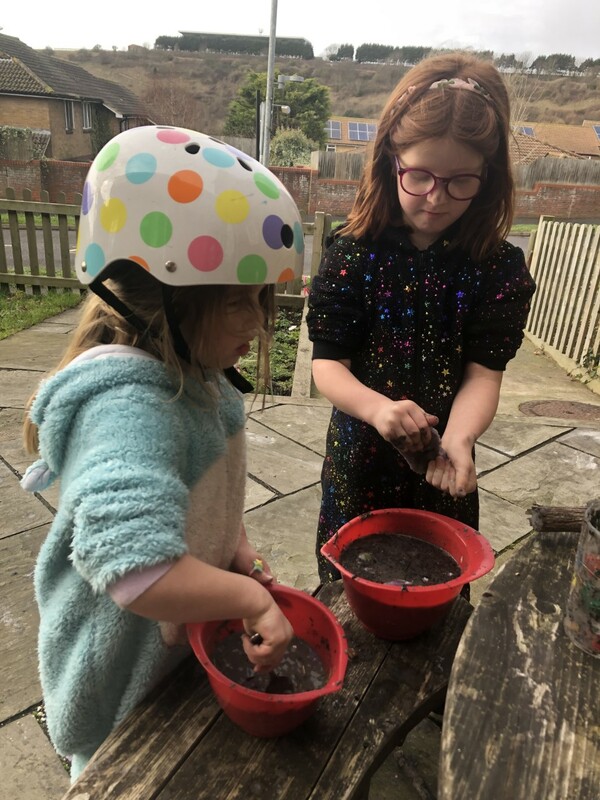 I took a breath, and went for the same talk that I've been having since there was more than one child in the house; 'in this house we don't do fair, we do selfless'. (It's not the first time I've blogged about it, and I doubt it will be the last!) If I had £1 for every time this phrase was used in this house, I'd have enough money to clothe everyone on my estate, I'm sure. I reminded her that we don't deserve any of the good things God has done for us, or given us. And that He selflessly gave His son to us. He handed Him down to us. He didn't treat us fairly, how our sins deserve, but instead has treated us with lavish love. She of course couldn't care less at this point. She was all consumed by the wailing. She wanted the sparkly onesie and that was that. I reminded her of the brand new onesie she got for Christmas from her Auntie, and the brand new, soft pink blanket (which zips into a bag) she got last week. I asked her if she would like to have to share it. She didn't particularly want to. I told her that she was allowed to feel a little disappointed, but that she mustn't live in that place, because then the darkness takes over, and you end up being consumed by your feelings, and both of you are robbed. I told my daughter, that we even needed to get to the place where she can say that she is happy for her sister. Quite the battle to pick for a Saturday morning, but some are worth picking. It took a while, and with the quietest of voices, with all her fingers in her mouth, she eventually said she was happy for her sister. (I don't mind too much at this point if it is heart felt, or a habit in the making). The husband is currently on the slopes, shoop-shooping down the mountains with a bunch of his friends. He's doing Blue and Black Runs and I'm doing the School and Asda runs. It so similar! (Although his week sounds exhausting). But the same principle has to stand, in our house we don't do fair, we do selfless. I am happy for him, like literally happy for him to be there. What a wonderful week he will have. What a blessing for him. I learnt from a friend of mine, that when he goes, he should go guilt-free, other wise it robs something from him. I can well imagine that I will need to remind myself of this this week, when I'm a bit done with the bedtime routine and extremely outnumbered at dinner times. 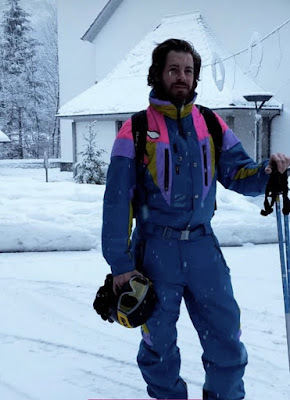 But remembering God's selfless act towards me really does help with that little thing called perspective, as does the fact that his friends made him wear a retro onesie on the slopes! My lunch yesterday, was a form of leftovers. I had made the girls a Frozen themed lunch. (Frozen the Disney film, as opposed to really cold stuff). 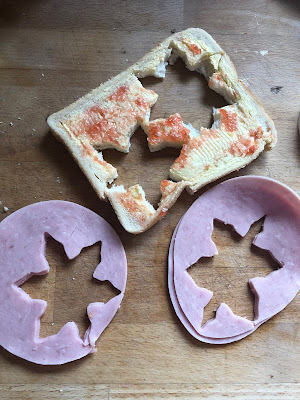 This mainly consisted of snowflake-shaped sandwiches, and snowflake-shaped ham, with a sprinkling of marshmallows, and of course, leftover sparkly Christmas tree biscuits. A fairly low effort, maximising on results! (The best kind of mothering). So I ate what was left; the bread and ham surrounding what was once snowflakes. The negative space which was left got me thinking...a somewhat perfect shape that was missing, caused something equally perfect left behind. The negative space was no less important, and no less tasty than the object or the 'positive space' as it were; the snowflake in this case. (Although I'm sure my girls would say that snowflake-shaped food tastes so much better). I have given two encouragements in the past, about 'negative spaces'. Often the negative space is the bit not thought of, or the bit thrown away, the part you leave behind, or maybe the bit people aren't really interested in, sometimes the least important bit... but many artists use the negative space to in fact emphasise the actual object, to highlight the positive space, to point to the main event, or at least to shift the perspective of what the main event actually is. I'm well aware that the negative moments in our life, although tasting a little bitter, do in fact, come together to compliment the whole picture. Those negative spaces, somehow grow us in character, and ultimately throw us more onto fully trusting God. I think it's important to stop and change our perspective, to not just look at whatever the main thing seems to be, or what we think it should be, or even what we'd like it to be, but to look at what is surrounding it, what is shaping it, what is holding it together. Maybe we feel part of the main thing, maybe we feel like the cut out bit that is left behind. Maybe we don't really want to acknowledge that the surrounding bit, is just as flavoursome as the fun bit. Maybe we'd be happy to throw some bits away that we think aren't necessary... And Maybe God wants us to appreciate that both parts are needed in order for us to grow from one degree of glory to another. God may just see the shaping of us in a very different way than we see it. Sometimes I look at motherhood as that perfect little shape in the middle; the bits where the kids behaved nicely in a restaurant, or gave an adult eye contact without any prompting, or they obeyed straight away, or possibly they were selfless towards a sibling, without even a mothering glare from me, or they threw their dirty laundry in the basket instead of on the floor? (Who am I kidding?! That one has never happened!). I forget that all the training, all the tantrums, their bad choices, my bad choices, all the surrounding bits, come together to form the actual shape in the middle. If I'm honest, as a mum, I feel like the kids are the main event, the main thing, the shape being cut out of me, and I'm the negative space left behind. But with a perspective change, I think that's okay, and possibly how it should be...(to a degree) - a giving of self. Was there a lack in Heaven, when Jesus left to become a baby? When He came to us, to relate to us, to rescue us? Was there a negative space in that moment? Did it take away or indeed add to the main event? Was there a lack when Jesus died? Was a negative space created in that moment? Was that death cast away, thrown away as not important? Or was it in fact the whole point; bringing glory and pointing to the most positive element of the whole of life and love itself? I recently wrote a talk to give at our church's Women's morning. I chose to preach from Proverbs 31; good ol' Lady Wisdom. I knew this was a bit of a gamble, as although some women love her, I'd say a fair number of women can't stand the poor girl. She is practically perfect in every way, and that annoys us, because we cannot reach the standard set before us. She causes us to compare our lives with her own, and we tend to fall short. She literally has the capacity of a Merchant ship, whereas we might not even want to get out of bed. She manages her household with precision and flair, whereas we might be swamped by laundry and be out of bread, again. She's looking out for the poor, whereas we might not even have enough for our own. She's making her own garments out of flax and wool, whereas we might be wearing a two day old stained jumper. She's one of those High Bar Bible verses, and I mentioned in my talk that only Jesus can reach the standard of perfection that God requires, and He did. He was and is, literally and practically perfect in every way. His love is perfect. His humility is perfect. His purity is perfect. His peace is perfect. His joy is perfect. His forgiveness is perfect. His strength is perfect. His timing and capacity are perfect, and if we're Christians, we get to live in His perfectness, His righteousness, even though we know we don't measure up. If we're not Christians, then it is available to us, by admitting our lack, saying sorry to God for it, and asking Him to exchange it all for what Jesus has to offer us. The frustrating thing about writing a talk, and studying scripture about it, is that you start to feel a bit uncomfortable in some areas. This can be the Holy Spirit bringing some truth and challenge to your own life, not just the lives of those you're writing the talk for. That's not what I signed up for, I'm bringing my wisdom to others, not God bringing His wisdom to me! (Folded arms, stamped feet, pouty cross face). At one point, I had set up my littlest with her favourite programme, and a wealth of snacks so I could be upstairs and write about managing a household. And all of a sudden she was back with me. I reminded her about her snacks and the TV programme, but she said she wanted to be with me instead. I was really frustrated by this, as this was my 'window' to prepare and I let my annoyance be known to her. I text a buddy about it, half joking and half reaching out to share my Grrrrr. She sent a prayer text back, which wasn't what I wanted either. I wanted empathy, and 'poor you'. Grrrrr. 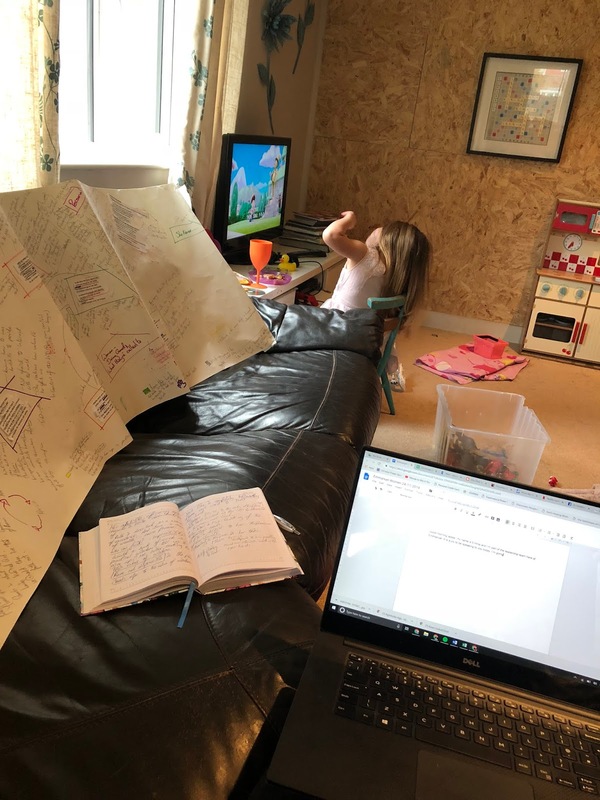 After a while I took my notes downstairs, set it all up on the sofa, near to my little one, and started writing a prayer of frustration instead of my notes. I felt a softening in my heart, as God reminded me that He is always available to me when I want to spend time with Him. And He loves it when spending time with Him is my heart's desire rather than anything else. My littlest was just showing me that in the simplest of ways. As I finished my prayer, the childminding babies woke up, so my window of prep was over. I hadn't worked on my talk at all, but God had worked on my heart, and I had managed my household a little better and spent time in the Father's perfect love. Throughout the preparation for this talk, God really spoke to me about who is in my household, and whether I'm running it well. I felt definite challenge in some areas, and encouragement in others. As a result I have even decided to lessen the hours I childmind. I literally need more time spent on my household, and have found a way for me personally to do so. I'm not practically perfect in every way, (especially practically to be honest - I forgot to pick up my own child from nursery last week). And I don't claim to be, but I do know someone who is, and it's only in Him that I can do anything He sets my hands to anyway. I have been going through the trusted Jesus Story Book Bible and making meals for each story. Some have required a fair bit of effort, some have required me just buying something easy, and some have required extra creativity (which usually means enlisting help from the Draw Close Blog folk. 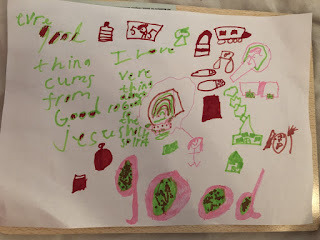 When each child got in from school, I asked them to write or draw things the Bible tells them to do which they don't do, and things the Bible tells them not to do, which they do do. (Two of the boys couldn't get past the fact that I said do do...hilarious toilet reference). I told them no one would see what they had written so they could be as honest as they wanted to, and then asked them to put it in a pot. I also did the same, which was quite a revealing activity; just taking the time to look at the things I do and those that I don't, and the motive behind those things. Probably something I should do more regularly, to be honest. At dinner-time, we read the next story; 'Get Ready'. It's all about Ezra reading the book of rules out to the people of God, and the people of God getting sadder and sadder as they realise that they have indeed fallen short of God's perfect standards. They had offended God with their choices. I reminded my kids of the things they had written down, the things which have been against God's best for us. (And asked for the posed photo of them all feeling downcast, like the illustration suggests). After encouraging the kids to at some point, say sorry to God for the things they had written down. I reminded them that we are to live in the celebration and Joy of what God has done for them. I reminded myself about it too. (Sometimes it's easier to teach the kids, than myself). I reminded them that Jesus is the only one who has kept to God's standards and we are in Him. Whoop whoop! This should lead us to celebration! Bring out the cake!! 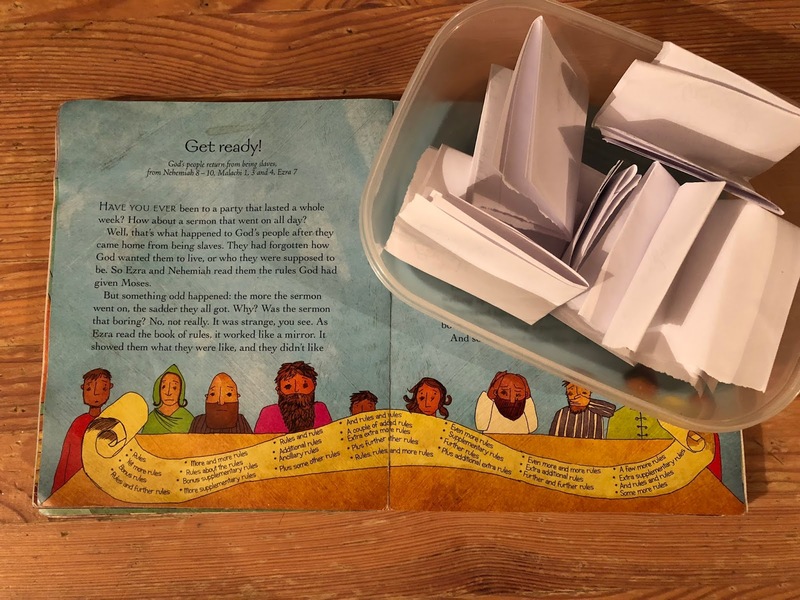 Some of my kids were unhelpful during this Bible teaching activity. After the fun photo op, they then joked around, distracted the others, and chatted over me. I told them that it made me feel like throwing the cake away, because their behaviour didn't deserve the nice treat. But unfortunately that whole thing just consolidated the whole point I was trying to make. Grrrr! I'm Emma, and in my house there used to only ever be one pink toothbrush, in a world of blue. I am a mum to 4 fabulous boys. Recently, not only have the pink toothbrushes grown in number, but pink in general has exploded into my life. I now have 2 fabulous girls too. I'm wife to the one & only Stephen. And by God's grace I'm attempting to love and serve them all. I'm learning that the best way to do this, isn't always through gritted teeth or aiming for unattainable perfection, but to walk closely with my heavenly father. For speaking arrangements email emma.dawson@live.com It's like me reading my blog to you, in person!